I am voting for Mitt Romney! Good for you for sharing, Sheila. That wasn't too painful, was it? I hope you'll do more of that, and tell people why you think Mitt's the man for the job! Augie, thanks for starting this conversation. You make good points. For me, I follow the same principles online that I do face to face: don't talk religion, politics or money. Now I'm known to slip up and break my own rule from time to time, but for the most part I don't find interactions on these topics to be fruitful. Mature adults tend to have well formed opinions on these matters and I think Godwin's Law is very much in effect. Further, as the article in today's WSJ points out (http://online.wsj.com/article/SB10000872396390444592404578030351784405148.html) people tend to be much more rude online than they would in real life. In summary, I agree with your ideals, but I believe there are a few principle topics that don't lend themselves to fruitful discussion online. In closing, four more years! Thanks John. I think the Pew stats speak for themselves. Mature adults may have well formed opinions, but REALLY mature adults are open to changing them based on new information and the way the world changes around us. 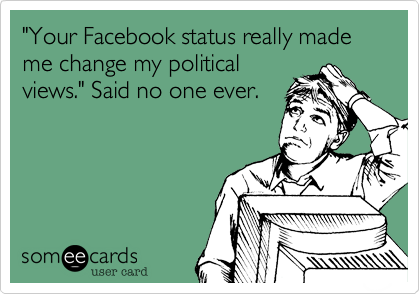 Given one in six people say they've changed an attitude on a political issue based on social media engagement, I think that may contradict your observation that political conversations don't lend themselves to being fruitful. That said, these conversations are tough, sensitive and can go south. I understand why someone may care to avoid them, but we cannot (IMO) applaud social media for helping to bring change in the Middle East and then bury our own heads in the social media sand because our own political discussions can be difficult. I appreciate your thoughts, as always! Okay, I'll take the dare w/ this tweet from Andy Borpwitz: The Dow Jones just hit a 4-year high, which means Obama is the crappiest socialist in history. I was one of those guys to felt the somecard rang of truth until the data demonstrated otherwise. I ate my words publicly on Facebook.